Left-wing activist David Hogg said the NRA are "pathetic f--kers" who want to kill children in a cringe-worthy, profanity-laced interview earlier this month. "They could have blood from children splattered all over their faces and they wouldn't take action, because they all still see those dollar signs," Hogg told The Outline. In an interview with The Outline, David Hogg attacked pro-gun politicians and the NRA, saying, "It just makes me think what sick f***ers out there want to continue to sell more guns, murder more children, and honestly just get reelected." "What type of s***ty person does that?" Hogg continued. "They could have blood from children splattered all over their faces and they wouldn't take action, because they all still see these dollar signs." Hogg said he is going to make sure that "those f***ers aren't getting reelected." Hogg said he does not want more school security because "We're going to create a system where we widen the school-to-prison pipeline." This notion of there being a "school-to-prison pipeline" has been thoroughly debunked. 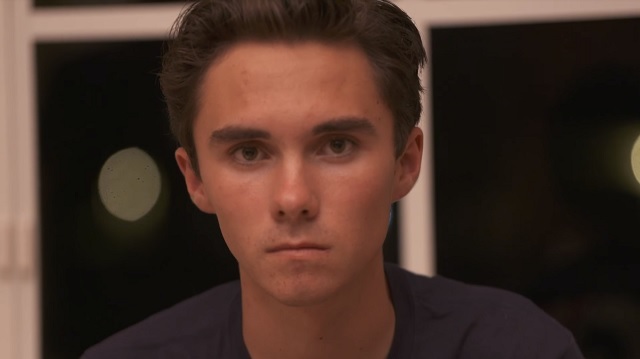 Hogg said it is his job to fix America because "our parents don't know how to use a f***ing democracy, so we have to." Yet, when he was asked what ideas he is coming up with for policies, Hogg replied, "I shouldn't have to! I'm 17." After repeatedly accusing the NRA and Republicans of being "pathetic f--kers" who want to kill children, Hogg went on to say we need to "come together as Americans, not as Democrats or Republicans, but as Americans and realize this is our live [sic], these are children." Our "live" are on the line here, folks.